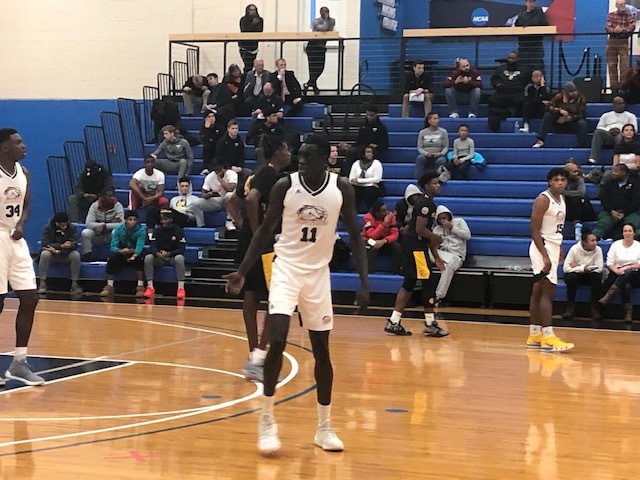 NEW HAVEN, Conn. — Akok Akok is one of two players at the National Prep Showcase eligible for the 2019 NBA Draft because of his age and the fact he’s one year removed from his graduating class. But unlike N.C. State commit Jalen Lecque, the 6-foot-8, 175-pound Akok has not yet committed to a school. And also unlike the 6-4 Lecque, Akok is not on ESPN’s 2019 mock draft while the bouncy Lecque is a projected first-round pick. ESPN’s Jonathan Givony, for one, believes Akok isn’t ready for the NBA. “Probably should head to college,” he Tweeted. Akok lists UConn, Georgetown, Providence, Pittsburgh and Syracuse as his final five schools, but it appears more like he won’t sign anywhere until the spring. Lecque said he’s leaning toward signing by Wednesday’s NCAA early signing deadline while keeping his NBA options open. “I’m just weighing out the options,” Akok said. UConn coach Dan Hurley and his staff have made Akok a major priority in the Class of 2019, and have visited him several times. Fresh off coaching in the 2K Classic at Madison Square Garden this week, Hurley is expected at the National Prep Showcase on Sunday for 2019 commit James Bouknight of the MacDuffie School (MA) and uncommitted Woodstock Academy (CT) center Tre Mitchell. UConn is in the mix for several 2019 bigs, including Akok, Mitchell, Kofi Cockburn and Flint Hill School (VA) big man Qudus Wahab. Both Cockburn and Wahab will sign late. Akok could also opt to enter the NBA G League next year, a route that Lecque said he definitely won’t do. The G League will offer $125,000 to select high school players beginning in 2019-20. Putnam Science coach Tom Espinosa, for one, doesn’t think Akok would be ready for the NBA next season.